Love is in the air at Bank of America Winter Village at Bryant Park! 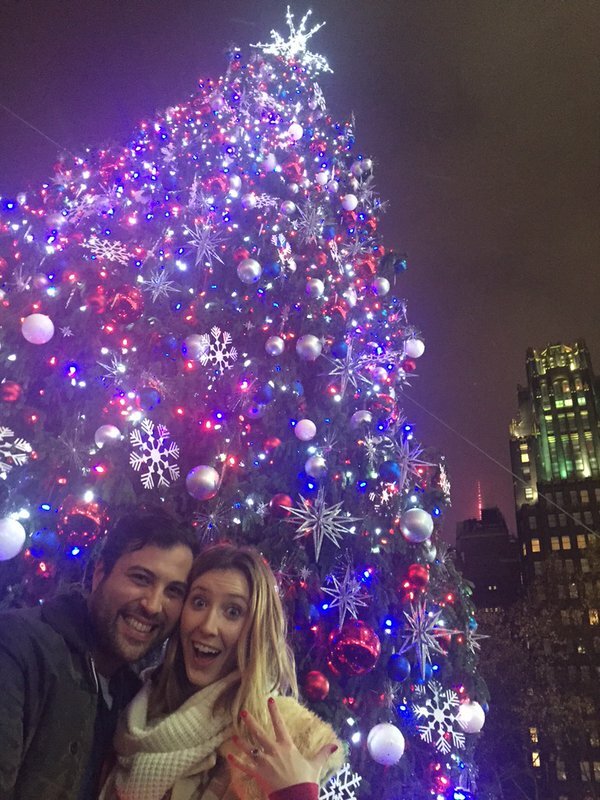 In a cute twist of fate, the start of a new Bryant Park Tradition, The Tree Lighting Skate-tacular, was also the start of a new family for its writer, Jon Caren. Caren, who wrote the script to The Lights Before Christmas, our ice show and tree lighting extravaganza, took the moments following the tree lighting to propose to his girlfriend, Carmela Corbett. "I knew it was primed to be a special night, being the inaugural Tree Lighting Skate-tacular in Bryant Park, and there's very little Carmela loves more than Christmas (Ok, maybe kittens, but the holiday is high on her list). The plan was to lure her to the tree for a picture after the ceremony and fireworks. When we got there, I quickly dropped to one knee and though I couldn't see it, I could hear a crowd gathering behind me. Of course I was nervous and forgot everything I planned on saying in that moment, but it didn't matter because she probably couldn't hear me anyway given all the murmurs and "awws" from our impromptu audience! Luckily, a stranger filmed the whole thing, and now we're both glowing like the lights and feel like we'll always be a small part of the park's long and storied history." Jon's story The Lights Before Christmas personifies the ways in which the holiday season melts away cynicism and lifts the audience's spirit to remind them what truly matters. We're certainly grateful Jon has contributed a special addendum to what we hope will be a long standing Bryant Park legacy. Congratulations to Jon and Carmela!